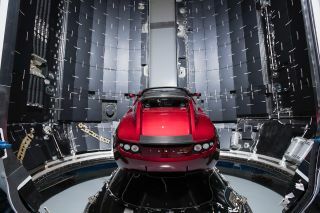 A cherry red Tesla Roadster will serve as the payload on the maiden flight of SpaceX's Falcon Heavy rocket. The maiden flight of SpaceX's Falcon Heavy booster, slated to launch tomorrow (Feb. 6), comes factory-equipped with a Tesla Roadster as a part of the payload/ballast, and is meant to be hurled toward a solar orbit that could take it as far out as the orbit of Mars. But what's the point of sending a car into space? Is it bound to become just more space junk? We asked spaceflight experts to weigh in. In a more recent tweet, Musk said, "Falcon Heavy launch simulation almost ready. Will be set to Bowie's Life on Mars." Musk also commented that the Tesla's glove box will contain a copy of "The Hitchhiker's Guide to the Galaxy" (Pan Books, 1979) by Douglas Adams, as well as a towel and a sign saying "Don't Panic" (an iconic phrase from the book). The Tesla Roadster's glove box contains a copy of the famed Douglas Adams novel "The Hitchhiker's Guide to the Galaxy. "I love the thought of a car drifting apparently endlessly through space and perhaps being discovered by an alien race millions of years in the future," Musk tweeted on Dec. 2. Hurling into space using an automobile as a mass simulator is certainly a first. Back in the early development days of NASA's Saturn V booster, several Saturn C-1 test boosters carried thousands of gallons of water to mimic the weight of fully fueled "live" rocket stages. But does shooting a Roadster into space constitute a frivolous addition to orbital debris? "He is shipping it out of Earth orbit, so I do not think that there is any risk here," said orbital-debris expert Darren McKnight, technical director for Integrity Applications in Chantilly, Virginia. "The enthusiasm and interest that he generates more than offsets the infinitesimally small 'littering' of the cosmos." However, McKnight said "it is [a] huge waste of a beautiful car, so I would be happy to take the brand-new red Tesla off his hands, and he can send my five-year old silver Prius into space." On Feb. 2, the Federal Aviation Administration's (FAA) Office of Commercial Space Transportation issued its launch authorization for the Falcon Heavy via Transportation License Number: LLS 18-107. A Tesla Roadster tops SpaceX's Heavy launcher. That license gives the go-ahead for flight of the huge rocket, noting that flight begins with ignition of the first stage from Launch Pad 39A at NASA's Kennedy Space Center (KSC) and transportation of the modified Tesla Roadster as a "mass simulator" to a hyperbolic orbit with the sun, meaning on a trajectory that will allow it to escape Earth's gravity. "Flight includes landing of the Falcon Heavy first stage core and side boosters as indicated in the license application," the license states. "A flight is concluded upon SpaceX's last exercise of control over the Falcon Heavy vehicle, including the safing of Falcon Heavy vehicle stages or components that reach a hyperbolic orbit." Boosterism or "big bang" theory? No matter how you look at it, the Falcon Heavy is a big deal. "This is in many ways the most significant launch since the first shuttle launch in April of 1981," Dylan Taylor, an active angel investor in commercial space ventures, told Space.com. "Falcon Heavy has the potential to open up commercial space to deep space for the first time ever." The rocket's first stage is composed of three Falcon 9 nine-engine cores, adding up to 27 Merlin engines. Those three cores are arranged in an "octaweb" structure. All that firepower makes for a chancy rocket launch, Musk said last July at the 2017 International Space Station Research and Development Conference in Washington, D.C.
"There's a lot that could go wrong there," Musk said. "It's guaranteed to be exciting." SpaceX's Falcon Heavy booster is ready for its maiden voyage. Indeed, "there's a lot of risk associated with the Falcon Heavy," and there is "a real good chance that [the] vehicle does not make it to orbit," Musk said in July, noting that he wanted to make sure he "set expectations accordingly." "I hope it makes it far enough away from the pad that it doesn't cause pad damage," Musk said. "I would consider even that a win to be honest. Yeah … a major pucker factor really is the only way to describe it." Musk mentioned several specific reasons why the Falcon Heavy's maiden flight may not go perfectly. One is the need for all 27 orbit-class first-stage engines to light at the right time. Another is the stress that the first stage's central "core" will experience during liftoff; the loads on the rocket, from aerodynamic forces to vibration and acoustic issues, will be quite high, he said. The Falcon Heavy will be a great vehicle, Musk said, but he added that there may be some kinks to work out, especially given how challenging the rocket's development has been. "It just ended up being really way, way more difficult than we originally thought," Musk said. "We were pretty naive about that." SpaceX's Falcon Heavy successfully gunned up its 27 main engines during a test fire on Jan. 24, though it was held down tightly on the launchpad. Does that 12-second test firing signal a potential successful flight? "Not really," said Jim Cantrell, CEO of Vector, a rocket developer in Tucson, Arizona, told Space.com. "It means that they can ignite all 27 engines at the same time. Liftoff will test the structural and flight dynamics of this new configuration and the guidance, navigation and control system that guides it. A lot can still go wrong as this is a massive undertaking." Despite all that could go wrong, however, Burt Rutan, legendary aerospace engineer and designer of the private suborbital craft SpaceShipOne (which won the Ansari X Prize in 2004), saluted Musk and his Falcon Heavy program. Rutan told Space.com that he thinks Musk's decision to put his car on an outward-bound trajectory was a great idea. Elon’s maiden trek of Falcon Heavy is "somewhere along the guts and chutzpah that we did for Apollo 8 — the first time you put people on a Saturn V and shoot for the moon," Rutan said. "Has anybody made that courageous of a flight plan since? Leonard David is author of "Mars: Our Future on the Red Planet," published by National Geographic. The book is a companion to the National Geographic Channel series "Mars." A longtime writer for Space.com, David has been reporting on the space industry for more than five decades. Follow us @Spacedotcom, Facebook and Google+. Original article on Space.com.